Tank auction! Get Your Military Vehicles Here! OK, you don’t see this every day! AUTOWEEK reports on the upcoming Littlefield military vehicle collection to cross the block in a Massive armored vehicle auction that features more than 200 military vehicles of (practically) all types. 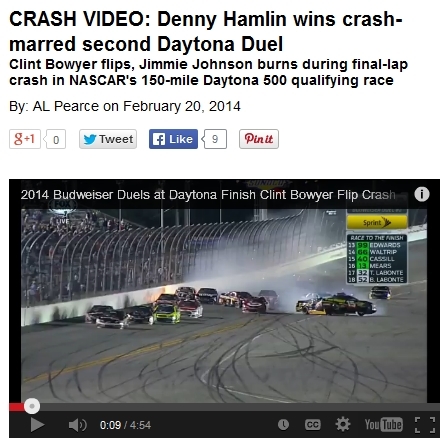 This entry was posted in Other Cars on February 28, 2014 by Dan Martin. Showing their cars and telling why they love them. This entry was posted in Other Cars on February 25, 2014 by Dan Martin. Watch from inside Danica Patrick’s car as it develops and takes her out with a pretty good bump. The crash sequence appears to have been initiated when Kevin Harvick #4 Budweiser drifted coming out of the turn into the left front quarter panel of car Brian Scott #33 Nationwide. 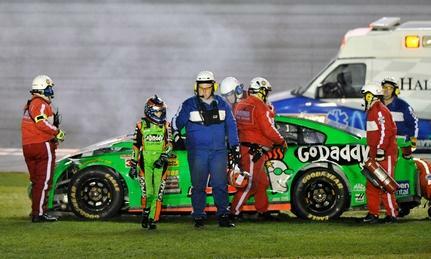 The comical thing is this photo showing diminutive Danica among those big, big boys. With appreciation to AUTOWEEK. Read AUTOWEEK’s report here. This entry was posted in Other Cars on February 24, 2014 by Dan Martin. This entry was posted in News & Notices on February 20, 2014 by Dan Martin. Low level from the cockpit of one of the world’s fastest jets, the front line Eurofighter Typhoon. This plane can fly up to 1,500 miles per hour. It ain’t a Jag, but it’d make a dandy second vehicle! This entry was posted in Other Cars on February 18, 2014 by Dan Martin. Photo shoot at Ft Carson, CO on Friday, February 14, 2014. View a slideshow of Jack’s Jag on Youtube and read about Jack’s XJ6 Vanden Plas here. With appreciation to Ft Carson for letting us shoot this extraordinary machine in their hitorical settings. Produced by Lance Medina with deep appreciation to Red Noland for releasing Lance for this shoot. Photographer: Dan Martin. This entry was posted in Member's Cars on February 17, 2014 by Dan Martin. No other ground vehicle can out-accelerate a top-fuel dragster. The fastest class in the National Hot Rod Association (NHRA) drag-racing series, these cars can rocket to 300 mph in less than 4 seconds. That seemingly physics-defying performance is why Jim Oberhofer, the VP of operations at Kalitta Motorsports, calls top-fuelers violence on wheels. Add expensive too. One run down the strip consumes fuel, bearings, valve springs and other parts to the tune of $5800. Stand nearby when a “rail” car lights off and you can feel the ground shake. It’s unnerving. These machines are so fast—topping 330 mph—that the quarter-mile track (1320 feet) was shortened to 1000 feet after Scott Kalitta was killed in 2008 when his car exploded at the finish and crashed into the catch fence. That tragedy did not deter the Kalitta crew. 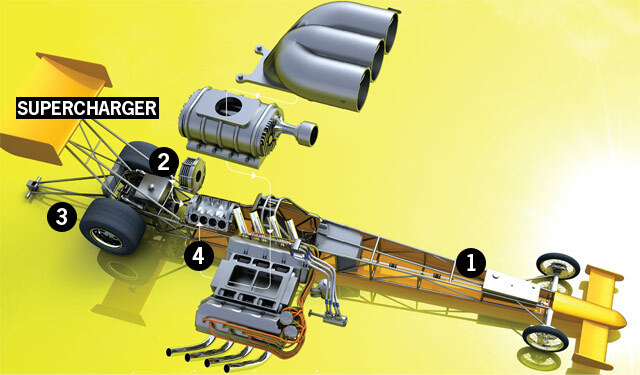 As the team prepares for the 2011 season, which starts Feb. 24, we peel off its top-fueler’s bodywork to learn the secrets of its insane acceleration. This entry was posted in Other Cars on February 11, 2014 by Dan Martin.